Today, The Crypto Blast takes a look at ParaBreakdown himself, Phil Poling. 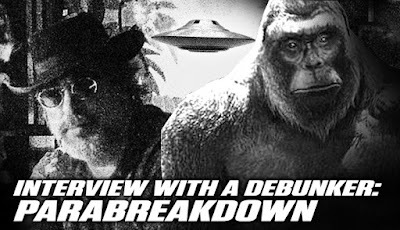 In the Bigfoot paranormal world, he's considered a heavy hitter with his debunking and critical analysis videos. He's a necessary voice on YouTube since there seems to be a plethora of flimflam hoaxer videos. We interviewed him and got to know what his background was and how it helps him with his videos. Something happened to you when you were 16 years old when you were in Oregon. What was it? You mean other than losing my virginity? Right - Well I did have what I still believe was an encounter with the huge hairy thingy called Bigfoot. I didn’t see it. I heard the howl very close and personal and very loud. Louder than any human could make but with the human like quality to it. Damn near knocked me down. Is that what first got you interested in Bigfoot? You did a breakdown video on Bart Cutino's FLIR footage from the Sierras. Do you still hold out that it's a real Sasquatch he filmed on August 23rd, 2012? I have never held to that belief. I have always said that it COULD have been 3 Bigfoots. I also gave credit for the amount of research and fact-finding that Bart and others had put into the investigation. Everything both pro and against it being real could be questioned. Over the past 10 years there seems to be a new mind set taking over Bigfoot research. The Woo, Bigfoot is your forest friend, your spiritual guide, can mind speak with you, interdenominational traveling, zap you, cloak, and transforms into balls of energy called orbs. With your experience and years in this field, what is the cause of this and your position on the Woo? I don’t know what the cause is because I’m not a sociologist. I can only say that you can find this kind of behavior in every sector of out society - people who want to believe in things without evidence or simply are looking for a place to belong. Why not believe in the fantastic? It’s fun. It’s controversial. A real conversation starter. Ancient Aliens, demon possession, government cover-ups - you name it. This is no different. So my personal position is no position. These things happen. The mind-set exists in our world and is everywhere. As long as it doesn’t harm anyone, let them think what they want. Your YouTube account, ParaBreakdown, is a fan favorite among paranormal fans. How did you get into debunking videos? Do any stand out to you this day? What is Super Soylent? You are rolling several things into one here but I guess one answer will do. Super Soylent was more of an “in your face" kind of YouTube channel where I would both debunk and/or bash on nut-jobs. It had a cult following and was a lot of fun at times. I still have some of those videos on that channel. I had 4 videos about Bigfoot there and, after seeing these, a friend suggested that I create a breakdown channel. I didn’t want it just for Bigfoot videos so I named it ParaBreakdown to represent all fields within the paranormal. What is Super Soylent? Well Soylent yellow is okay and Soylent Green was even tastier but Super Soylent is the ultimate. With your background being in law enforcement and the coast guard, how do those experiences help you in critiquing paranormal videos? It helps a great deal. It has taught me to reduce statements and claims down to the most common denominator and, once there, to observe what is really at the root of it and then give my opinion. It’s really very simple if you think about it. It’s a matter of asking questions and noting the results. 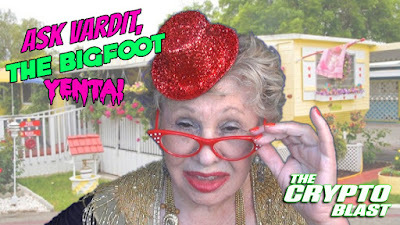 You say you're not a Bigfooter, what would you call yourself? A researcher or maybe an analyst? I don’t put my "boots on the ground" but then again I don’t claim to do so, nor claim that I am a Bigfooter. Stacy Brown Jr. from Bigfoot Bounty contacted you and wanted you to do a breakdown video on his thermal footage. You did a comparison on Stacy Brown Jr. Bigfoot thermal from Finding Bigfoot. What were your results? It didn’t match. The area - the trees. I think that either he couldn’t find the original location or was just blowing smoke. My question to him has never been answered. The person who filmed this is his father. So where are the interviews and comments and answers from him? That is the root of the matter. I think if you get him to talk you will have the answer to all of the questions about this video. You think Bigfoot might be real based on your own experience. With the Bigfoot community being entirely opinion based, how do you keep from turning into a total cynic? "Turning into?" I don’t think people turn into anything that they are not inherently. But I don’t want to get to deep here - I got what you mean. For me, it’s the realization that it just doesn’t matter. In the over-all scheme of life, faith, world events and our private lives, it’s just a weird diversion. What’s the big deal? You have an ongoing series called Unexplained Universe with Sir Richard Allen. How did that podcast come about? I blame Matt Knapp (blogger). He and I had a Bigfoot related show and the interest went away right after we brought on Summer Akasha Snape (it had nothing to do with her). Summer and I were kind of left to figure out if we should do a show and Matt brought in his creation. Unexplained Universe was already set up by Matt. So he just handed it to us. The show now consists of Mad King Richard (the cruel), Niki Slick and myself. We talk about all sorts of weird and unexplained things and just try to have fun with it. To keep it simple I just post this on the ParaBreakdown YouTube channel. Animosity, pettiness, and jealousy seem to always rear its ugly head in the paranormal world with other researchers and armchair Bigfooters. How do you keep your cool when the research turns into personal attacks? For the most part I ignore it. There have been a few times where I have attempted to reason with people but have always come back to the realization that you can’t change a hard felt belief, regardless of how ridiculous it is. I don’t know these people personally. I don’t get in bed with them at night - so why should I care about what they think about me or my videos? If you were standing in front of a college classroom (Bigfoot 101), what would you tell those young minds to steer them in the right direction? Question everything. When you hear a claim or see a photo or video just ask the basic who, what, where, how and why of it. Find the source. Question that source. The facts aren’t just given to you by the presenter. You have to dig for them. Thank you for taking the time to do this interview with us and for being a part of our Crypto Blast family. You can follow Phil Poling, A.K.A. ParaBreakdown on YouTube here. Excellent interview, Phil rocks and rolls with his no nonsense approach and use of knowledge.